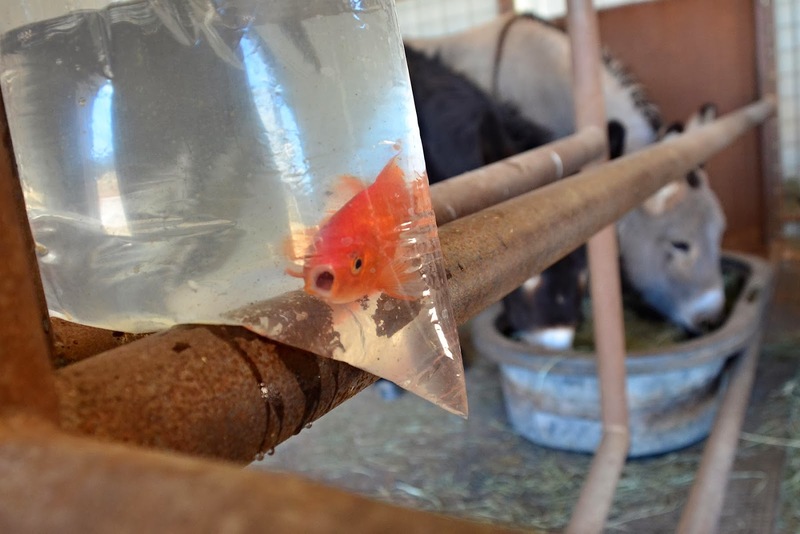 Farmers and ranchers have been known to put goldfish in their stock tanks to control mosquito larvae and algae. I've always wanted to try this but for one reason or another have never gotten around to it. 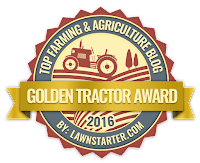 Then Danni mentioned on her blog last week that Mr. Goldy was celebrating his fourth anniversary in her stock tank. I looked at the pictures of her pristine stock tank, then I looked at the deplorable condition of my stock tank, then I went to the fish store. Who knew my tiny town even had a fish store? And it was right there on the way to the Walmart. the small and seemingly helpless five-for-a-dollar variety ("they grow real fast," she said), or the big and strong one-for-$7.50 specimen. I went for the big guy. My confidence in his ability to survive grew as I listened to him noisily splashing around in his bag all the way home. He seemed like he would be able to hold his own against the herd and the elements. He was still alive by the time we made it back to the ranch, which I took as a good sign. Lucy: What do you mean I have to share you with yet another herdmate? There was a collective "WTF?" when I showed him to the boys. Alan: I've never tasted sashimi but I hear it's pretty good. George: Danni, I'm gonna get you for this. Fish: Where's all that algae you promised? I'm getting hungry here. Fish: No fair! You didn't tell me a cat was part of the deal. Bait and switch! I wanted to give Fish a proper start in his new life, so I scrubbed and refilled the stock tank before moving him to his home. but I am so stinkin' sick of self-kinking hoses, I thought I'd give this new-fangled thing a try. So far, so good. Hank was the first to investigate and didn't seem to mind the company. Nobody likes to drink alone. Alan was too busy navigating the mud to worry about a silly fish. George: Is it me or does the water taste like fish poop? 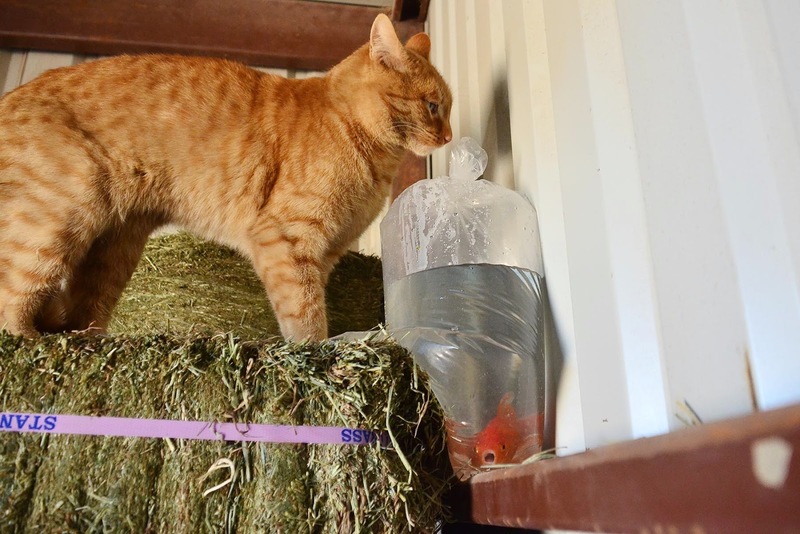 As I write this post Sunday night, I'm happy to report that Fish survived his first 36 hours at the ranch. I'll give it another week before working on a name. Johnny suggests you name Fishy "Dinner." I'm glad you didn't show Mr. Fish to the chickens. They would have him for lunch. Better that they don't know. I saw some pictures of goldfish(koi ? carp?) in a very large stock tank and wondered about it. Did some reading. Apparently the little innocent goldfish we see in the stores need 55 to 100 gals of water! Each! I remember as a child that we were told a small bowl or tank would restrict their size. Some folks reported that the racoons were thrilled with the new additions. 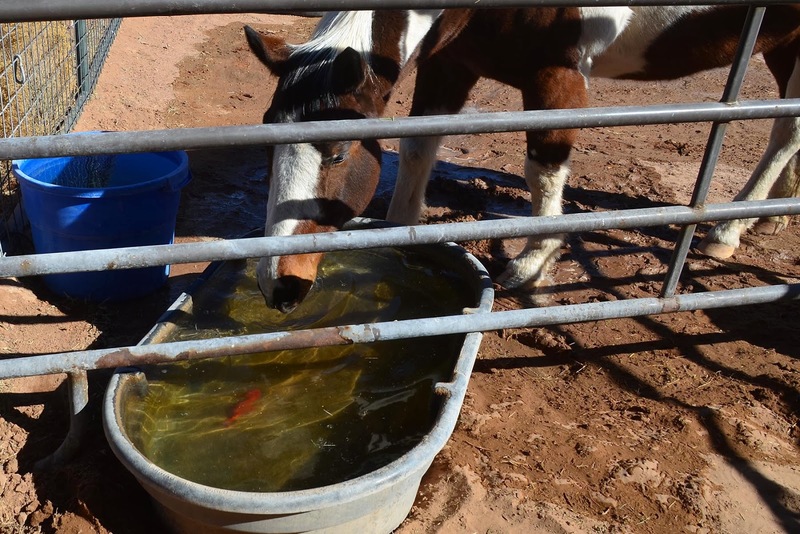 Others had no predation issues, other than the equines spitting out the new fish that had not learned to avoid large thirsty mammals. Will you need to provide some shade when summer arrives? ... names, names ... will this christening involve country music? You don't think Johnny is going to go fishing? 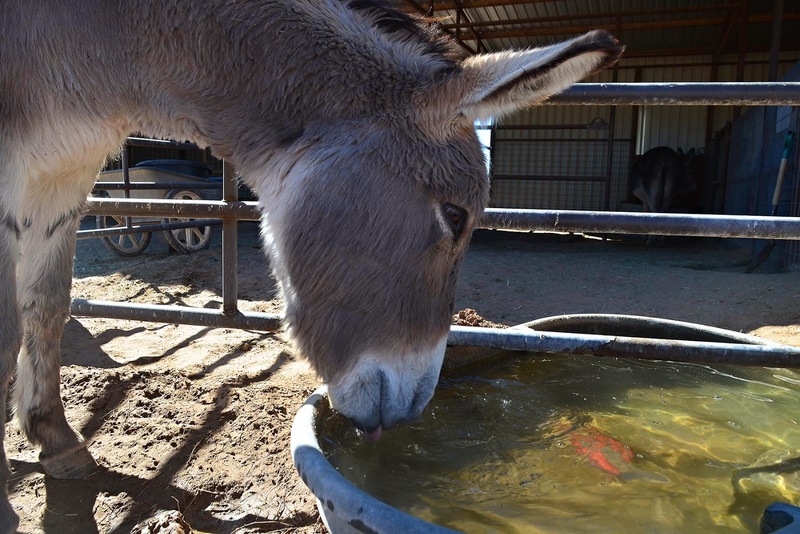 I love the photo of George as he catches a glimpse of his new herdmate swimming in the bottom of his water. Another addition; hope they all get along! what a cool idea... and i like that the goldfish is not in a bowl... i can't stand to see them in tiny bowls... this guy has room to swim... but he needs a mate don't you think? Lucy and Ethel vote for 'Babalu'... The photo of that fish with Johnny is hilarious. 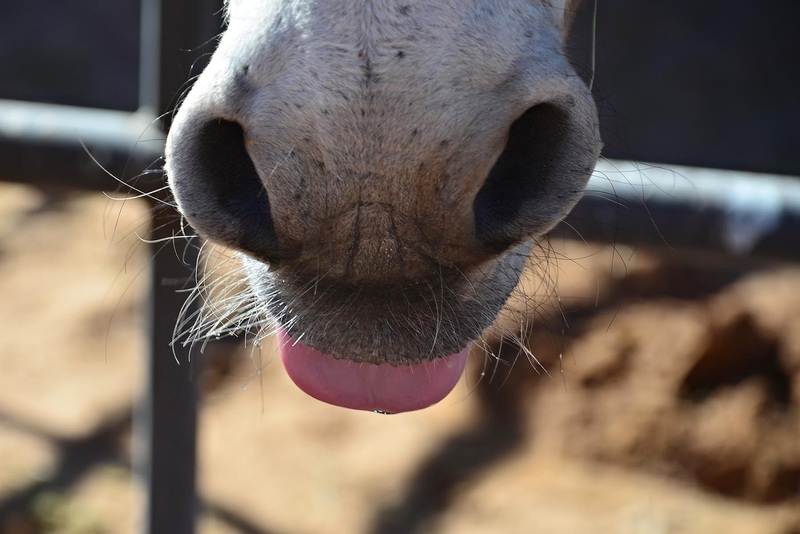 A friend of mine was just telling me last week that he has one from when he had horses, It's been over 10 years since he had him in the stock tank. 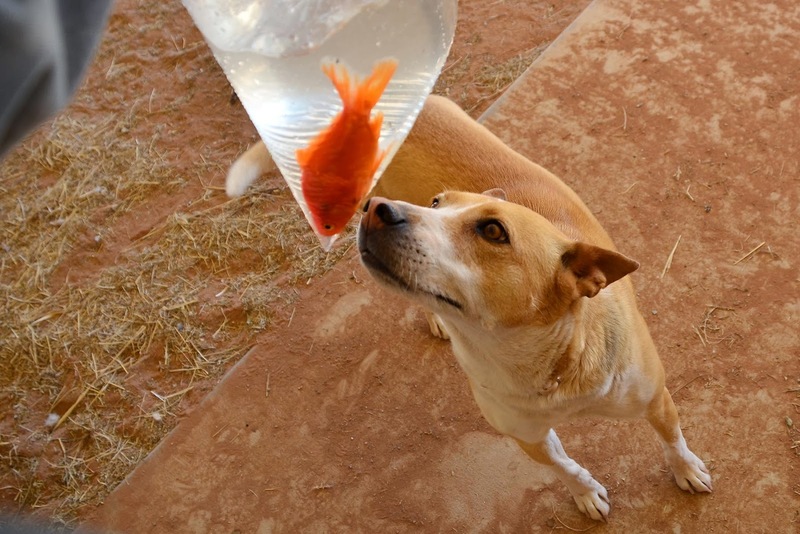 Okee dokee....What a lovely goldfish it is too. I have a water feature on my front enclosed patio, that just begged for some "wildlife". I too wanted to make sure I wasn't adding to the mosquito population and got 3 little goldfish to do their duty with the algae and the bugs. They lived in the "pond" until they got to chasing each other and 1 flew out and committed hari kari. Then the next winter it was so cold that I got worried about them (sound like anyone else you know?) and brought them gradually into the house so as not to shock their systems. Well, all these years later and they are filet of fish size and inside fish. 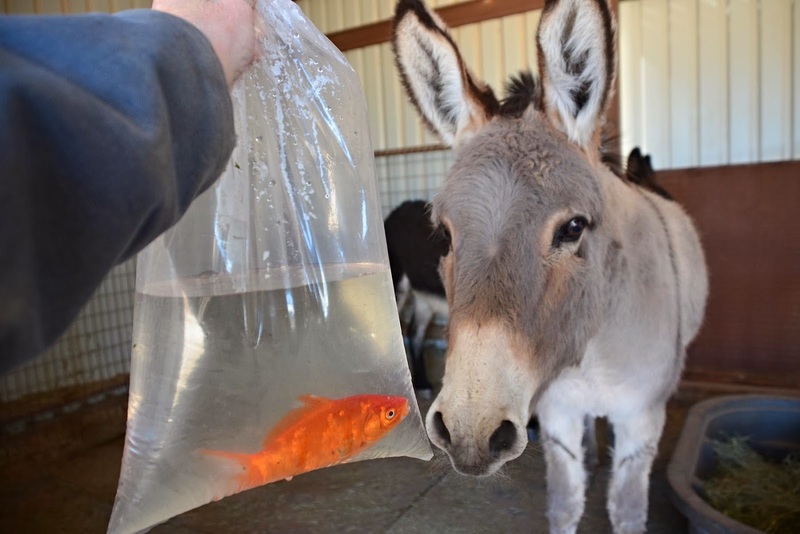 But I know that you are assigning a job to this big guy and he will be the stock tank fish....can't wait for the name. I called mine "Sushi" after he got really big! One note on the pocket hose, which I thought of picking up myself until I Googled it. What I found was that the inner part is toxic to animals, just wanted to pass along what I found. "DO NOT DRINK FROM THE NEW "POCKETHOSE" because of the chemicals used in the product that will leach into the water! The "do not drink" warning is buried in the product packaging, and it is not posted on the website and needs to be! Their website is pockethose.com, you may recognize it from TV advertising. 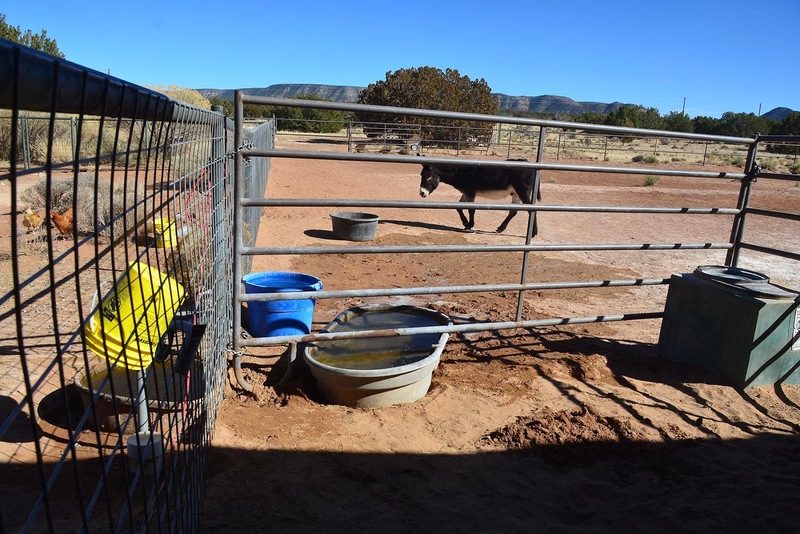 I especially want to pass this along to horse people as this looked ideal for filling the horse trough in the winter, because it's light, compact and easy to drain and bring back into the house so that it doesn't freeze. 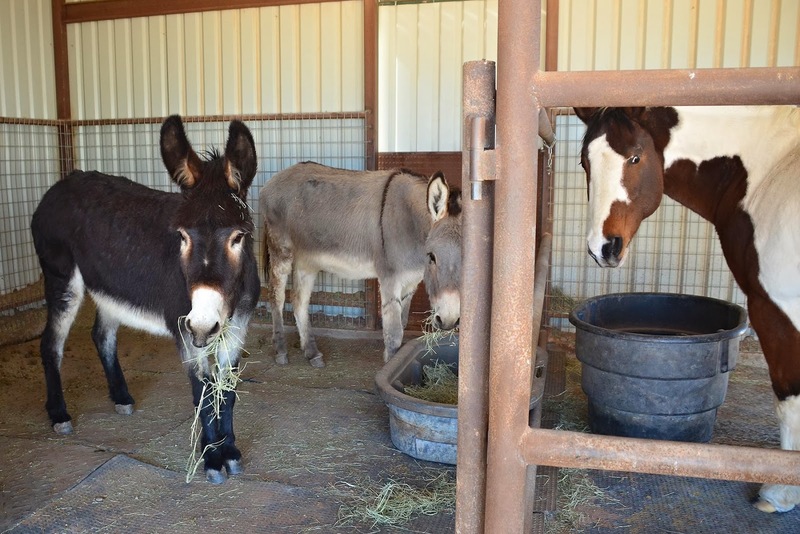 I also thought it would be great to store in a horse trailer or camper for drinking water or horse water. I ordered a few of them from the website, and the website does not disclose any warnings. The hoses come in a plastic container with a label, and the caution is on the INSIDE of the label where most people will not look. Each hose has a small instruction tag attached to it, but no warnings there either. DO NOT drink from this hose. 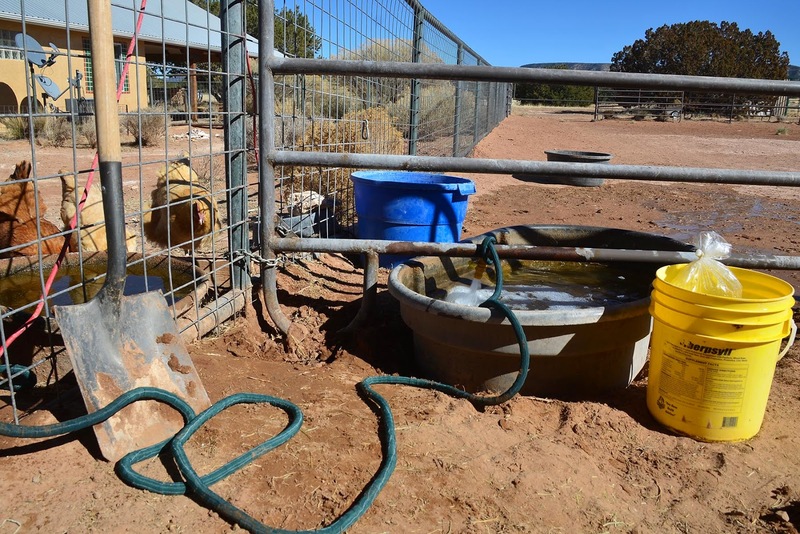 The water in this hose may become contaminated and cause serious health effects. I thought the warning might just be because bacteria can grow in any hose, so I called the product's customer service line, and the person I talked to CONFIRMED that these hoses should only be used for things like washing your car and watering plants. I directly asked him about using it for horse water and he said no, do not use it for animals because of the chemicals that will come out in the water. I am going to push for them to disclose this in their advertising, but in the meantime please help get the word out!" I had TWO goldfish in my tank for the past 2 1/2 years. Just before winter hit, I lost one of them. I am down to one now. They were about three times the size of the feeder fish, and no where near the size of yours. You should of stayed smaller, and got TWO of them! LOL Mine survive the winter times, and hang out near the tank heater. I do need to get a few more for the tank, but want to wait till we move. I do not like the thought of fishing out tiny goldfish to move the tank from one house to the next. If those Ladies only knew they could fly to the top of the fence and see sushi for lunch down below. hahah we always had goldfish in ours... i don't think any lasted long enough for us to have an anniversary for them though... 4 years is really impressive! 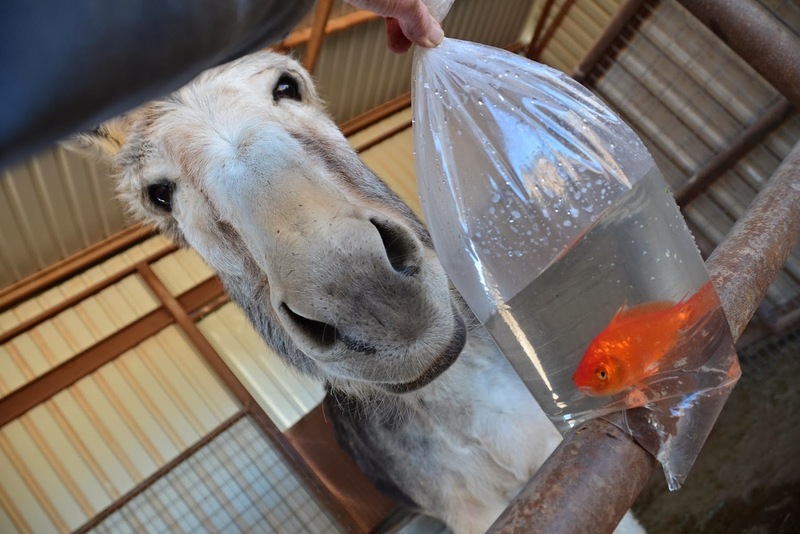 We had fish in tanks for years, however we always provided them with a cover to give them protection from the sun and from incoming horses because well some will develop a taste for fish!! 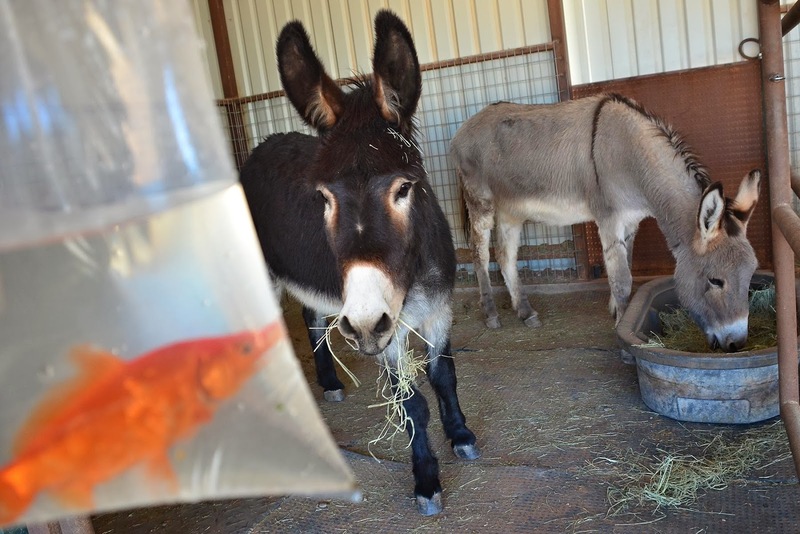 We have one horse we can't put fish in because he likes to eat them no joke. Also with having a shallow tank I would worry about as he gets bigger him jumping out or the cat/racoons getting to him, I would suggest maybe a bigger stock tank! I just want to add that not all feeder fish are small and helpless. My sister ended up with six smaller feeder fish seven-eight years ago, two died within the first week, one lasted a year before it croaked. We the three for awhile for six years until one jumped out of the tank, and the other two have been going strong. The bigger one is about the size of a hot dog bun and the other one is just a bit smaller, and both have had tragic health incidents that they've recovered from quite well. I wish our temps were do-able for our water tubs... they freeze solid and the fish would die, although I love the idea. Instead I take a scrub brush to it once a week to keep the crud out in the warmer months. Anybody remember the band Country Joe and the Fish?